When Jeffrey Loria decided to once again blow up his Marlins, it sparked a brief outrage over the $500 million in public money that had been spent on the team's brand new stadium. These outrages happen every couple years or so and are forgotten in time for the next bond issue. Public financing of stadiums for private teams is common enough now that it's largely taken for granted, even though these deals rarely produce anything of real value for the municipalities that fund them. How did we reach this point? Has it always been like this? And just how much have we paid for our sports infrastructure? The map below is an attempt to answer those questions visually. It charts the construction of 186 NFL, MLB, NBA, and NHL stadiums from 1909-2012, which covers pretty much all of them. The size of the stadium icon is proportional to the total cost (inflation-adjusted to 2012 dollars), and the color is proportional to the method of financing, with 100 percent private showing up in red, 100 percent public in blue, and a range of purple in between. 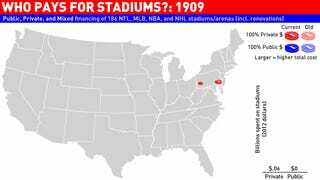 Major renovations are included as well, and stadiums are faded out when they lose their professional team. Stadium data from 1909-2003 come from the fantastic research of Judith Grant Long at Rutgers University. Data since 2003 come from a variety of sources collected by the author, including some compiled by the Minnesota Convention, Leisure & Tourism Association. These 186 stadiums cost $53.0 billion in 2012 dollars, of which $32.2 billion—or 61 percent—was publicly financed. That's a shitload of taxpayer money. Public financing of stadiums is not a new development; it began with the Los Angeles Memorial Coliseum, which opened in 1923. Los Angeles was also the first city to devise a more complex public/private-funding mix: Dodgers Stadium was 25 percent publicly funded in 1962. The mid-century urban-renewal movement led to a major boom in ugly stadium construction, most of it publicly funded. From 1956 to 1976, 50 stadiums were built—2.4 per year—at a cost of $10.8 billion in 2012 dollars, with 75 percent coming from the public. In the previous 47 years only 27 stadiums had gone up, at a cost of $1.0 billion, with 47 percent coming from the public. By 1957 more public money had been spent on stadiums than private, and it's stayed that way ever since. Recessions are bad for the stadium business. In the 10 years from 1977 to 1986, during which span the country fell into a double-dip recession, only six stadiums were built, at a cost of $1.0 billion, of which 90 percent was public. The 1990s and early 2000s, on the other hand, were absolutely insane. From 1991 to 2004, a whopping 78 stadiums—5.6 per year—were built or underwent major renovation. This came to a cost of $26.0 billion (61 percent public). While stadium growth has slowed since then—only 18 stadiums built since 2004—private funding (53 percent) has actually surpassed public funding for the first time in decades. This is largely due to four mega-projects: Cowboys Stadium, new Yankees Stadium, Barclays Center, and MetLife Stadium. Combined, those projects cost $5.4 billion, of which $4.5 billion was private (83 percent). Even adjusting for inflation, older stadiums were super, super cheap. Before 1961 only two out of 32 stadiums cost more than $100 million in 2012 dollars: Soldier Field and the Boston Garden. There are many reasons for this (capacity, labor) but a lot of it boils down to greater fan expectations. Cowboy Stadium's scoreboard has 23,040 square feet of LED display; Fenway's has a dude who changes the numbers by hand. Four of the five most expensive stadiums ever built have gone up since 2009. The most expensive, though, was Montreal's Olympic Stadium, which was built for the 1976 Summer Olympics and came out to over $2 billion in 2012 dollars. Expos fans, please tell me something about your team that isn't super depressing. Football stadiums (including MLB/NFL multi-use stadiums) got the most public funding, at 68 percent, while NHL arenas (including NHL/NBA multi-use) got the least, at 45 percent. 65 of these stadiums, about a third, have already lost their professional teams and/or been demolished. These ghost stadiums cost $8.8 billion, of which $6.6 billion (75 percent) was paid for by the public. Many of these included horrible outer-city 1960s and '70s megastadiums that were largely funded with taxpayer dollars, only to be shuttered in the '90s and early '00s.